I’d describe most cooking as an art of sorts, something that allows the cook a certain freedom of expression in the design and construction of a dish, some latitude to interpret a set of instructions into something new and different. I don’t think that about baking. It’s a set thing that does not change. Deviate from the recipe at your peril. This shows more about my lack of confidence when it comes to baking than it does about the discipline itself. I’m terrified of messing up something that’s destined for greatness by fiddling with the ingredients, which stops me, quite successfully, from experimenting or straying from the well-trodden path at all. That said, I did chuck some mixed nuts into a banana bread last week, with surprisingly good results, so maybe there’s a shade of the radical left in me yet. 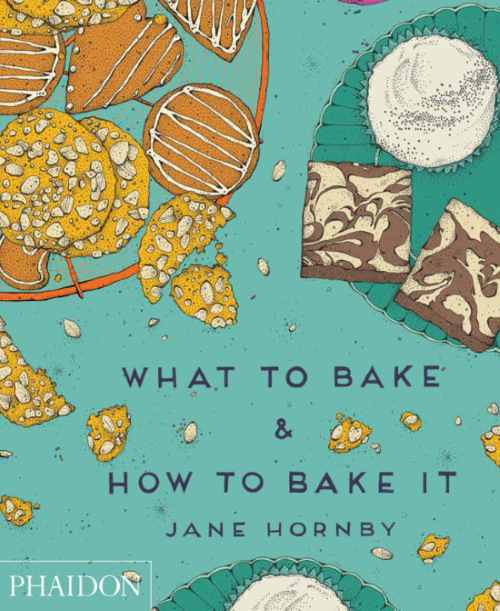 This book, Jane Hornsby’s What to Bake & How to Bake It is for people like me. It has clear, easy to follow recipes, broken down into simple steps. The photography is sharp and consistent, with every instructional step shot from directly overhead. The recipes include all the ones you’d expect to want to bake, and a few to stretch the more experienced baker. I’m tentatively dancing around using the cliché of ‘it does exactly what it says on the tin’, but that’s basically true. Hornby’s book is a clear instructional guide for all those people who lapped up that baking show on the telly and fancy a go themselves, and for anybody with a passing interest in baking cakes and the like. Actually, it does more than this – it’s a useful reference text for anybody, really, and the things I’ve cooked from it so far have been uniformly excellent. I’ve already made an astonishing chocolate cake, and next up, there will be a tarte au citron, a caramel and walnut coffee cake straight out of the Seventies, and perhaps a cranberry stollen, billed as a Christmas loaf that I reckon I can still get away with because it’s still winter. Baking doesn’t have to be so terrifying but I know what you mean ingredients are costly, time is precious and you want something spectacular to show for your efforts.